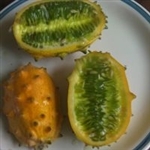 Cucumis sativus was domesticated in India, at least 3,000 years ago, and probably spread to Europe via the Roman empire. It had reached the British Isles by the 14th century. Sow cucumber seeds one or two to a small pot or large module in February or March in a propagator, heated greenhouse or on a window-sill. The seeds need a temperature of about 20C to germinate. When the seedlings have emerged put them in a bright place but keep pretty warm. Cucumbers won’t grow much in the polytunnel until nights warm up in May. Dig bucket sized holes about 60cm apart where the plants will finally be planted out and fill them with well-rotted FYM, about half a bucket per plant. Then cover the FYM with soil and ground cover. Plant the plants through the ground cover, and water well. Protect from slugs. 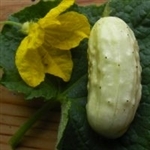 Cucumbers enjoy warm moist soil but can suffer from fungi if humidity is too high. For best results the plants should be trained up wires and have their side-shoots removed. Suyo Long, is a traditional long-fruited variety from China. It has a mild-flavoured, ribbed fruit growing up to 35 cm long and is considered a ‘burpless’ type. Cucumis sativus A small, thin skinned 'English' type cucumber with crisp delicious flesh. It has no bitterness and does not need its male flowers removed. Best under cover as more tender than others. Sow in March and plant out in April or May.